Thousands of sea oats, so vital for preventing coastal erosion, are being raised in this rural Florida Panhandle community more than 30 miles from the nearest beach and without a speck of sand. They are being grown hydroponically with roots dangling in nutrient-rich water. It's a method being touted for saving energy by the scientist-businessman who developed it and state officials who provided money for his research. Sea oats have been grown in nurseries and transplanted to beaches, where they trap sand and help restore dunes, for three decades. Jon Hovanesian said he began growing them hydroponically in 1994, a year before hurricanes Erin and Opal slammed Panhandle beaches. "A lot of people try to grow them but can't," he said. "It's not a very easy plant to grow." "Sea oats live in the harshest environment on the face of earth - sand blast, sand burial, drought, high heat, low heat, salt, desiccation - everything you can possibly imagine besides a glacier," Hovanesian said. "And then they have to deal with tourists and residents." In that harsh environment, fewer than one in 10,000 seeds become plants, but the success rate can hit 95 percent in a greenhouse, Hovanesian said. Hydroponic sea oats need less space and water and fewer chemicals while generating no pesticide runoff, state environmental officials say. The process saves energy it would take to make the chemicals and pesticides and there's no need for fuel-guzzling tractors. Hydroponic sea oats do very well on the beach if transplanted with an absorbent material containing nutrients, said Chuck Hamilton, public works director for Gulf Shores, Ala., a Hovanesian customer. "They have grown fantastically," Hamilton said. Hydroponics date back 5,000 years when Egyptians made paper from papyrus grown in water. In the 1950s, thousands of hydroponic tomato growers went out of business - unable to compete with low prices for conventionally grown varieties. Tomatoes and sea oats, however, are as different as apples and oranges, according to Hovanesian, who has seven employees and wears two hats. He is director of Agriculture Innovations & Research Inc., a nonprofit organization that seeks grants, does research and owns greenhouses covering 60,000 square feet in Allentown. Hovanesian also is president of Coastal & Native Plant Specialists, a for-profit company that applies AIR's research and leases its greenhouses to commercially grow sea oats and other plants. AIR has received a series of research grants from the Florida Energy Office, part of the state Department of Environmental Protection. "This ecologically friendly cultivation method employs few resources and reaps tremendous results," said DEP Deputy Secretary Allan Bedwell. Conventional sea oat growers, however, are conceding nothing. "I don't think at any point hydroponic is superior," said Otto Bundy, executive vice president of EcoGroup International, a major sea oat grower in Parrish, a small town in southwest Florida. Competition has become intense and sea oat prices have fallen by more than half since the hydroponic plants hit the market. It now costs about $750 to plant 10,000 square feet, the amount usually needed on a 100-foot wide lot, Hovanesian said. Hydroponic sea oats also are produced in North Carolina, said David Nash, a cooperative extension agent in Wilmington, N.C. Nash said that in 1995 he adapted the system used in his state from one developed for tobacco plants. 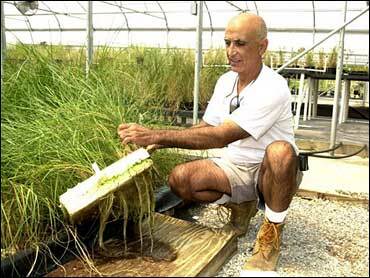 The Florida Energy Office this year awarded Hovanesian a $60,000 grant. A small part of it will continue the sea oat work but most will go toward developing hydroponic onions and submerged sea grasses. Hovanesian is excited by the commercial prospects for sweet onions. He envisions three crops a year and 120,000 pounds per acre compared with one crop and 40,000 pounds for regular farming. "It just blows row crop production out of the water," he said. "Plus it's energy efficient, no runoff, no herbicides."